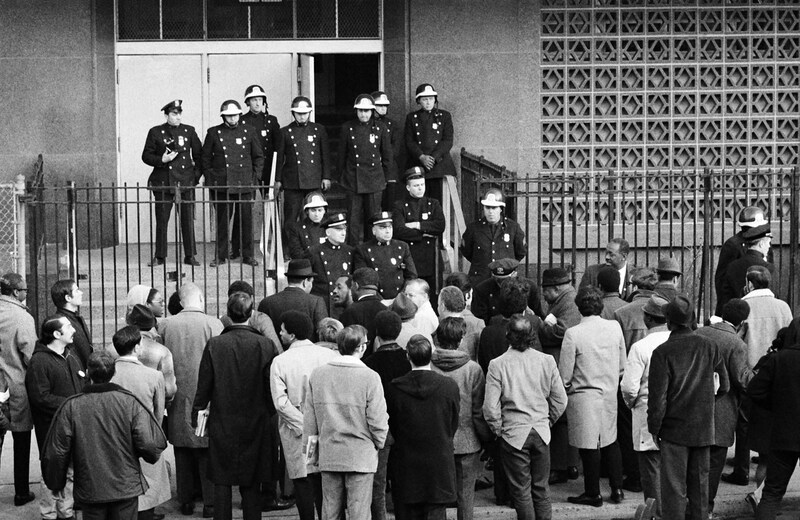 A police cordon blocks teachers and students from entering JHS 271 in Ocean Hill– Brownsville on December 3, 1968. This article is adapted from Dana Goldstein’s new book, The Teacher Wars: A History of America’s Most Embattled Profession (Doubleday). For as long as there have been teachers unions—and they date back to 1897—there have been tensions between them and other progressives committed to public education. In Chicago at the turn of the twentieth century, settlement-house crusader Jane Addams thought teachers union leader Margaret Haley was wrong to resist tougher classroom evaluations. In 1965, Lyndon Johnson created the Teacher Corps, a sort of proto–Teach for America, over the objections of the National Education Association. But it wasn’t until the urban teacher strikes of the late 1960s and early ’70s—when unions opposed black and Hispanic community control in favor of job security for predominantly white teachers—that the unions became downright villains not only to anti-labor conservatives but, for the first time, to large segments of the American left. In the push for community control, we see a precedent for many of today’s school-reform battles. Just as the Ford Foundation, in the late ’60s, funded parent activists in Brooklyn who eventually took over their school district and tried to fire tenured teachers, so today Bill Gates donates to “parent-trigger” efforts in California and other states, where school reformers help low-income parents organize petition drives in favor of overhauling the management and staffing of their children’s schools, sometimes turning them into nonunionized charter schools. Both then and now, reformers who describe themselves as progressives assert that unions impede the creation of quality schools. In 1967, Howard Kalodner, a New York University professor and prominent schools activist, spoke for many when he professed a desire “to destroy the professional educational bureaucracy.” Today’s reformers have coined the term “the Blob” to refer to the same tangle of bureaucracies—teachers unions, school boards and teacher-education programs—that Kalodner denounced, equating loyalty to these institutions with a belief that minority students lack intellectual potential. This vilification of teachers unions misses a much more complex reality. Even as the unions argued—often in a tone-deaf way—for job-security protections that few parents could support, organized teachers were (and remain) potent advocates for many of the education policies that most benefit disadvantaged children, from tuition-free pre-K to better training for teachers. Despite this fact, as Northern school boards and mayors resisted desegregation in the wake of Brown v. Board of Education and the hopes for an integrated Great Society curdled, the community-control and Black Power movements loomed with a forceful critique of teachers unions—a critique that was eagerly adopted by the liberal elite within philanthropy and government, and one that remains potent today. Sometime in early May 1968—the exact date is lost, as the district kept few records—a hall monitor named Cecil Bowen observed Richard Douglass’s art class at Junior High School 271, a low-slung red-brick and blue-tile building in Brooklyn’s Ocean Hill–Brownsville neighborhood. Bowen later reported that when he stepped inside the classroom, he saw students shouting and flinging paint at one another as Douglass stood by helplessly. Bowen broke up the fight. With funding from the Ford Foundation, Ocean Hill–Brownsville held elections for a community board, which then hired Rhody McCoy, a principal with ties to the Black Power movement, to lead the newly formed independent district. Yet in the first year of the new system, instruction in the district barely improved. Students still roamed the hallways. Teachers were restive. Long before collective bargaining, it had been difficult to oust an experienced teacher. Teacher tenure, after all, had existed in New York since 1917, and in other cities since 1909. Only in rare cases (or during panics like the Red Scare witch hunts of communist teachers) would districts pursue an expensive and time-consuming trial to terminate the employment of a tenured teacher. This “due process” was the bedrock principle of teacher unionism, the protection that could help prevent teachers from being fired because of their political leanings, gender, race, religious beliefs, pregnancy or opposition to administrative policies—all once-common practices. But what could be done about teachers who were just plain bad at their jobs? Working around tenure rules, administrators and the UFT established an informal backstage process for removing—or, more accurately, juggling—ineffective tenured teachers: a principal would put in a request with the Board of Education that a teacher be transferred to another school, and as long as the principal removed no more than one or two teachers per year, the union would not typically raise objections. In this way, bad teachers hopped from school to school, often ending up at schools in the poorest neighborhoods with the least political clout. Could neighborhood schools hire and fire en masse based on a community’s instructional and even political preferences, even though teacher contracts had been negotiated at the city level? The union argued they could not, and it sent several of the dismissed Ocean Hill–Brownsville teachers back to work, where they were met by activists—some affiliated with black separatist groups—who physically prevented them from entering school buildings. Two weeks later, when 350 UFT teachers walked out of the Ocean Hill–Brownsville schools in solidarity with their dismissed colleagues, the community board attempted to terminate their contracts as well. Mayor Lindsay hadn’t approved McCoy’s plans and didn’t know how to react. This seemingly local event triggered not only the most infamous and largest teachers strike in American history, but also a political and racial crisis of national proportions, which continues to reverberate in almost every debate about contemporary school reform. On one side, community-control advocates argued that the education of poor black and brown children was too urgent a matter to bother with labor protections, bureaucratic protocol or even basic politesse—much the same argument we hear from opponents of teacher tenure today. On the other side, the UFT worried that allowing parents and noneducator activists to essentially fire teachers they didn’t approve of would devalue the professionalism of educators and return them to a climate of constant job insecurity. What’s more, the unionists feared—and argued loudly—that a community-control movement affiliated with Black Power separatism could potentially turn neighborhood schools into places of political indoctrination. In reality, the Ocean Hill–Brownsville dismissals were as much about competence as ideology. Art teacher Richard Douglass, for example, had been transferred from another middle school, whose principal had also complained that he lacked classroom-management skills. Like most teachers in Ocean Hill–Brownsville—and low-income schools across the country—Douglass had received no special training in how to work with poor children, students with behavioral problems or non-native English speakers. In fact, he was an adherent of A.S. Neill, the Scottish education theorist whose 1960 bestseller Summerhill described the radical pedagogy of the boarding school he had founded in England, which served children from mostly affluent families. Summerhill students lived “free from adult authority,” allowed to play or learn in whatever proportion they saw fit. Children voted on rules and punishments, and parents were encouraged to take a hands-off approach, getting involved at school only with their children’s permission. The art room at Summerhill was an unstructured place where students could pursue whatever projects they liked. Douglass was plainly an ineffective teacher. So were some (though not all) of the other teachers dismissed alongside him, who admitted later that they had trouble managing student behavior. The summer following the dismissals, the Board of Education conducted hearings to determine the fate of those dismissed teachers who wished to return to their jobs in Ocean Hill–Brownsville. A widely respected African-American judge, Francis Rivers, served as trial examiner. He threw out the cases of four of the dismissed teachers, saying that they had been targeted not because of problems in the classroom, but simply because they had voiced skepticism about community control. Of this group, Daniel Goldberg, a UFT rep, was considered an especially gifted social-studies teacher. His supposed offense had been sniping about the district’s administrative practices to a colleague at a Christmas party. In the cases of Douglass and five other teachers, Rivers concluded that the district’s accusations of classroom-management problems, lateness and even corporal punishment were impossible to substantiate, since McCoy’s administration kept no record of observations or other personnel matters. On August 26, 1968, Rivers ordered McCoy to reinstate ten of the dismissed teachers, along with the 350 who had struck in solidarity the previous May. When the UFT teachers arrived at JHS 271 on the first day of school that fall, however, it was clear that many would not be allowed to work. Administrators “paired” returning union loyalists with teachers considered friendly to community control, and several union-affiliated teachers reported that when they began to teach, their partner teacher either led the students out of the classroom or directed them to disrupt the lesson. It was chaos, an all-out factional war. Union president Al Shanker had to decide how to respond. He believed McCoy and the community-control movement were bullying union teachers because they were skeptical of Afrocentrism, and that if this behavior was allowed to stand, black teachers could be bullied because of their race, too. At a UFT meeting, he advocated a citywide walkout, arguing, “This is a strike that will protect black teachers against white racists and white teachers against black racists.” The union’s delegate assembly voted in favor of the strike, and 93 percent of New York City teachers chose to honor the picket line. In Ocean Hill–Brownsville, 60 percent of students continued to show up at school during the strikes. The district attempted to function with replacement teachers, who were culled from several groups that were critical of union leadership: the African-American Teachers Association, a black separatist group; white liberal supporters of community control; and young New Left activist teachers who judged that the staunchly anticommunist Shanker was insufficiently opposed to the Vietnam War. The impasse was finally resolved in late November, when the New York State Board of Regents placed Ocean Hill–Brownsville under state management, essentially ending the experiment. The strike had exhausted the public and politicians, whose support for school decentralization had been predicated mainly on the hope of ending battles over desegregation and less on what community-control advocates were really demanding: the empowerment of low-income, minority, sometimes radical parents and activists to control the budgets and agendas of local schools. Of course, the strike itself was an educational setback for the students, a situation widely blamed on the union teachers’ insensitivity to children’s needs. Shanker boosted this perception when, in the midst of the controversy, he gave a lecture at Oberlin College. An audience member asked him if he was worried about the strikes affecting children, and Shanker replied: “Listen, I don’t represent children. I represent the teachers.” It remains among his most-quoted statements, often used to denigrate the teachers-union movement as a whole. Yet the needs of teachers and children were not always so diametrically opposed. That was one of the lessons of More Effective Schools, a successful program the union created and lobbied the city to implement, which improved academic outcomes in part by hiring more teachers for poor children, and providing those teachers with extra training on leading diverse classrooms. In fact, Judge Rivers noted in his decision that teachers in Ocean Hill–Brownsville had sought professional help in order to better serve their students, and that they were ignored by administrators. Union positions were not always to blame for disappointing student outcomes. In 2008, New York City Mayor Michael Bloomberg and his hard-charging schools chancellor, Joel Klein, shut down Ocean Hill–Brownsville’s JHS (later IS) 271, citing decades of persistently low test scores. Physically, the building remains largely unchanged since the time it was the UFT’s strike staging ground. But today it houses the Eagle Academy for Young Men, a school that has proven popular with Ocean Hill–Brownsville parents: in 2011, 1,600 students applied for eighty-four seats. Why do thousands of families finally appear enthusiastic about a school in Ocean Hill–Brownsville? As if in response to parents’ demands during the 1960s, the Eagle Academy, though a unionized school, emphasizes a longer school day and stricter discipline, with required uniforms and even military-style routines. As at many other “no excuses” schools, teachers refer to Eagle Academy students as “scholars” to emphasize high academic expectations. The school is supported by a foundation whose board of directors is dominated by executives from companies like News Corporation and Credit Suisse. A separate advisory board includes two community members along with a number of education professionals from organizations like Teach for America and Scholastic, the publishing house. Though the rhetoric of black-separatist politics has all but disappeared, in many ways today’s “no excuses” school-reform movement has inherited the mantle of community control by aligning low-income parents with elite school reformers and philanthropists from outside their neighborhoods. Yet for all that support, the Eagle Academy is not much more successful, in measurable ways, than JHS 271. The tide of gentrification that has swept other Brooklyn neighborhoods has not reached Ocean Hill–Brownsville. The Eagle Academy is deeply segregated (less than 2 percent white); a quarter of its students receive special-education services; and 76 percent live in poverty. Only 13 percent of Eagle Academy middle-school students are reading at grade level, and a mere 6 percent are proficient in math. Student achievement there remains an unsolved puzzle, which suggests, perhaps, that one of the twentieth century’s original liberal movements for improving education—desegregation—should not have been forgotten. Just a decade ago, the movement to desegregate schools was considered hopelessly outdated; today, a growing number of charter-school leaders are opening new schools, like Charles R. Drew in Atlanta and the Larchmont schools in Los Angeles, that seek to serve diverse student bodies. Even Michelle Rhee, the former Washington, DC, schools chancellor and teacher-accountability hawk, noted that in a perfect world (as Warren Buffett once advised her), private schools would be illegal. She actively recruited college-educated parents to enroll their children in DC’s public schools because she knew that more socioeconomic integration had the potential to improve education for all the city’s children. This year, the Obama administration issued new regulations allowing charter schools that receive federal funds to weight their admissions lotteries in order to achieve racial and socioeconomic diversity. It’s a good first step, but we need more: a set of housing and education policies that create more racially and socioeconomically integrated neighborhoods and schools. Research from Maryland and North Carolina shows that many effective teachers prefer to work in socioeconomically integrated settings, as opposed to ones overwhelmed by the challenges of poverty. Poor students earn higher test scores when they attend schools with middle-class kids. And integration doesn’t require the lightning-rod busing programs of decades past. Instead, cities should embrace inclusionary zoning and other efforts to increase the supply of affordable housing, and school districts should open more magnet and charter schools that use a special curriculum (such as coding or the arts) to draw children from across a region. This could be the agenda of a renewed education-reform movement that both unions and their critics within the Democratic coalition might support—one that moves forward by re-embracing the promise of Brown v. Board of Education.